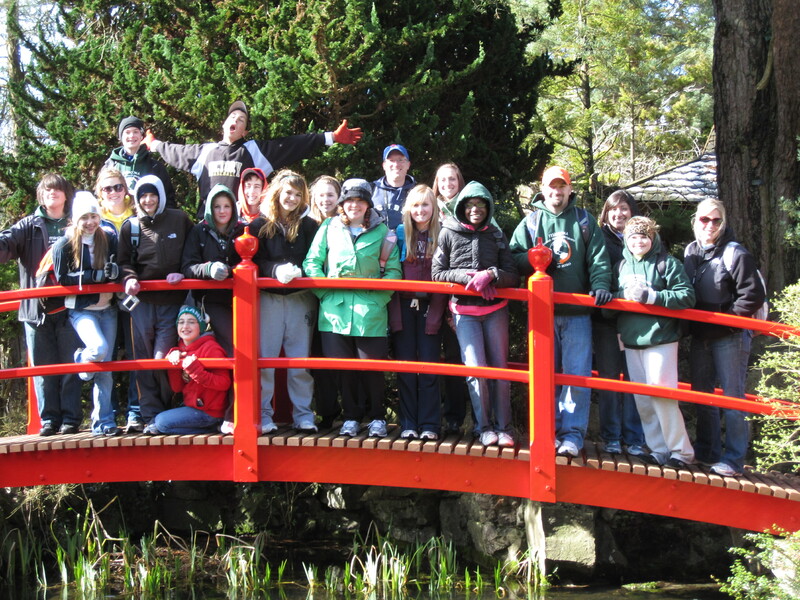 Sixteen American students and five teachers in a Japanese garden in the middle of Ireland. Our fourth adventure had us exploring the Emerald Isle to tour ancient ruins, stroll through Viking settlements, and experience culture and literature. We began in Dublin and made a big circle around the island, stopping in Cork, Kerry, Sligo, Derry, and Belfast. With both Ireland and Northern Ireland on the agenda, 2010′s trip made it eight countries that TAP visited in just four years (Germany, England, Greece, Turkey, Italy, and Vatican City). This trip had a lot of firsts for TAP. It was the first trip that Mr. Curtis was totally in charge for. It was also the first trip where we used Facebook throughout our trip to update folks back home with pictures and statuses to show all of Minooka what we were up to in Ireland. We also published the first TAP book, something that has become one of the cornerstones of our program – a guidebook/textbook/journal all rolled into one that the students write and create themselves. Those books go everywhere with us on tour and eventually become the greatest souvenir that anyone takes away from their trips. It was also the first trip for Miss Filetti, who joined Mr. Curtis, Mrs. Harig, Miss Lara, and Mr. Doerr on the Irish adventure. Our first stop in Ireland, was another TAP first – the first time a TAP teacher returned to somewhere they’d been before, we landed in Dublin and Mr. Curtis had flashbacks to his visit to the Emerald Isle back in 1995. I said so fifteen years ago, and I say it today – Dublin is one of my all time favorite cities – one of the few places I’ve traveled to that I constantly feel the urge to return to, one of the few places that I feel like I could actually live and feel at home. That kind of sums up the Ireland trip for almost all of us. I think Ireland remains one of the favorite trips for many of the travelers, simply because you feel so at home. The people are warm and inviting, the landscape is beautiful, and the culture is… well, it’s just right. Our first day in Dublin took us to the Croke Park sports museum. Croke Park is Dublin’s version of Soldier Field – a working stadium filled with history and nostalgia, but it’s also like an Irish sports hall of fame. There we learned about hurling, rugby, and Gaelic football, along with other sports that are popular in Ireland, like golf, horse racing, boxing, and soccer. We learned about the life of Irish writer Oscar Wilde while standing across the street from his house. The next few days were spent visiting O’Connell Street and the sites of the Irish struggle for independence. We also toured Trinity Cathedral and St. Patrick’s Cathedral – learning why Dublin is one of the only cities in the world with two cathedrals. 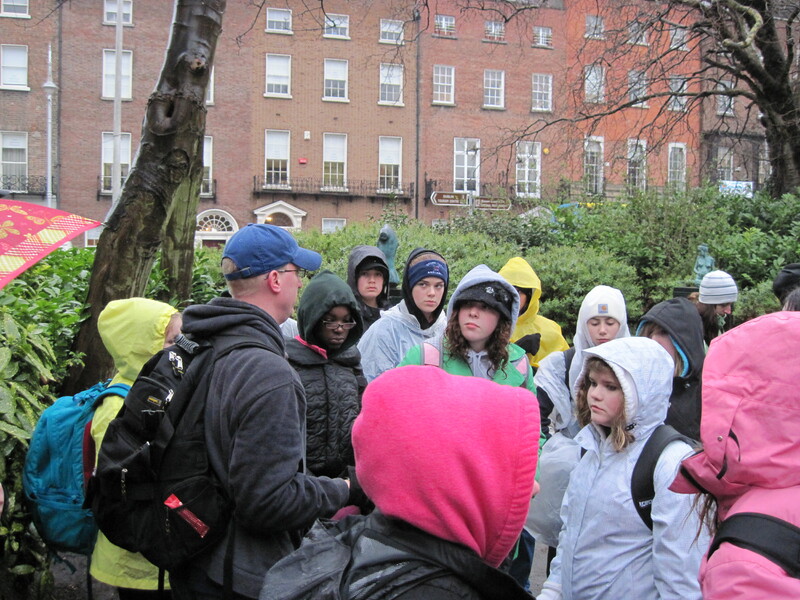 We saw the resting places famous Irish leaders, poets, and authors, learning awesome stories about people like Oscar Wilde and Jonathan Swift. Afterwards, we visited the pieces of the city walls built by Viking invaders, Dublin Castle – built by the Norman invaders, and treated an Irish dinner buffet like a bunch of American invaders. Our next stop was The National Stud, a race horse breeding farm. We had an awesome guide who showed us the farm’s most successful race horses as well as the brand new colts. We learned more than we’d bargained for about breeding animals, and, in the middle of Ireland, got to visit a Japanese garden. The farm also had full sized models of ancient beehive houses, the style of home people in Ireland lived in hundreds of years ago. Kilkenny has a really cool looking castle, but having just seen Dublin Castle, and knowing that we had plenty more castles on our itinerary, we skipped right past it, dashing through the heart of town to reach St. Canice’s Church. St. Canice’s is a beautiful old church, but the highlight of this stop was the Round Tower. Built in the year 800 A.D., it was the oldest man made structure we’d seen so far, so of course when the opportunity arose to climb it, jumped at the chance. A series of wood ladders made it hard work to get to the top of the tower, but most of us made it all the way. Once you get to the last ladder, you emerge outside from out of the tower’s floor. There was barely enough room for all of us up there, and since there was no way down while twenty-five other people were climbing up behind you, you were staying up there a while. Our patience and hard work were rewarded with a remarkable view of Kilkenny. That night, Lorna, our tour director, convinced the manager of our hotel to open up a banquet area for us and she spent the evening teaching us the basics of Irish dancing. Some of us got pretty good at it. Only one person slammed into a wall so hard that the wall broke a little bit, but we don’t like to dwell on things like that. Our Irish dancing skills – or lack of them – came back into play later on in the trip. The hotel we danced in that night was within walking distance of one of the sites we’d been looking most forward to – Blarney Castle. We started down in Blarney’s dungeons, exploring the caves beneath the castle, then we worked our way slowly to the top of the building, peeking through the murder hole, pretending to shoot through the archer’s slots, and, of course, making sure to stop and kiss the famous Blarney Stone. Afterward, we took a long stroll along the ruins of the castle walls, imagining ourselves as defenders of the castle, watching imaginary invaders race across the open field in front of us. Then we took the other role, spending a great deal of time exploring the castle grounds, running around like knights and outlaws through the woods, into and out of waterfalls, and around all sorts of rock formations with cool names like the Druid’s Cave, the Witch’s Seat, and the Wishing Steps. It was a magical afternoon. 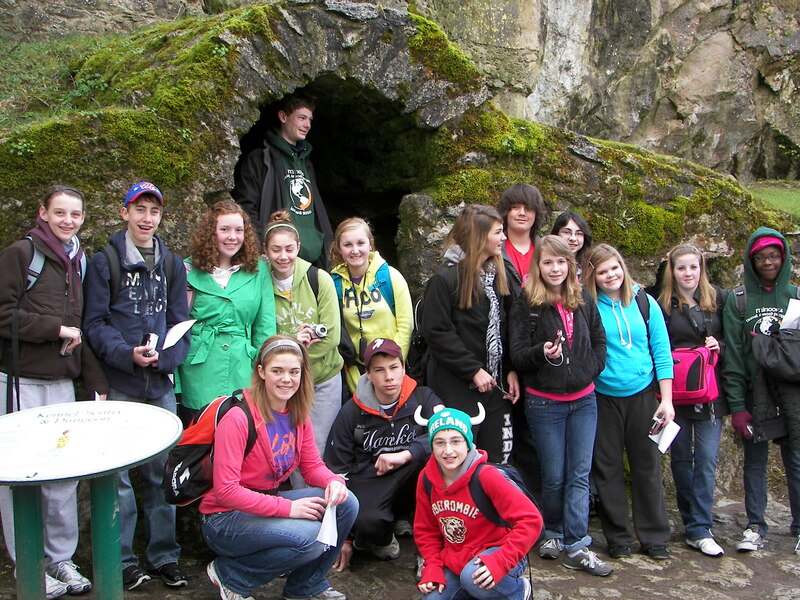 The dungeons of Blarney Castle. In Cobh (which is pronounced Cove – yeah, we know) the next day, we got to see the last port the Titanic stopped at before heading out to sea. They have a really nice museum dedicated to the Titanic and other ocean liners of the time period that give you a real sense of the history. After a quick lunch, we explored the town, learning its history from a nice, older gentleman who was on his way to church, but decided that it’d be time better spent if he gave us a quick tour of his town, showing us the cathedral and the prison cells that are built beneath the church. Some people think it’s odd that a guy on his way to church would just stop, change his mind, and give a tour to a bunch of American teachers and students. We don’t think it’s odd. It’s Ireland. That’s how proud these people are of their home towns and how unbelievably friendly they are. Kilarney was a favorite for a lot of the teachers and the students. It’s just a small, friendly Irish town, but there we got to ride in the famous jaunting carts – horse drawn carriages driven by men known as jarvies. The jarvies told fantastic stories of Irish history and mythology, stories that were just real enough (or maybe our jarvey was just charming enough) that they seemed incredibly real. They took us five or six at a time on a ride through the Kilarney National Forest, stopping for photo ops at Lough Leane and Ross Castle. That night we headed out for an evening of Irish music and dance at Kate Kearney’s Cottage. There we got to put some of our new dance skills to the test, had a chance to try out some Irish instruments, and met two of the funniest musicians we’d ever seen. A few of the kids got to play with the band, most of us danced with some real Irish dancers, and Mr. Doerr even got a chance to sing a song for the group. Of course, he chose America the Beautiful. This day still goes down as the all-time favorite for most of the TAP teachers – it’ll take an awesome experience to top a day as perfect as this one. We had a chance to “cut turf,” see how thatch roofs are made, and meet some tiny horses and some enormous dogs at the Glenbeigh Bog Village. The village was a recreation of an Irish bog village from hundreds of years ago, and we stopped there on our way through The Ring of Kerry, a scenic drive through the southwestern portion of the island. On our drive we encountered wild goats and countless sheep dotting the rolling green countryside. We met Brendan, a real-life shepherd, who gave us a demonstration on how he trains his sheepdogs. A perfect rainbow showed up over the Atlantic to make our day even more magical, and that was before our stop in the tiny village of Sneem – the postcard perfect little village you’d hope to find in an Irish adventure. The day ended with a hike through a mossy forest, along a path made up of green stones, to a gorgeous waterfall. We couldn’t have written a script better than the way this day played out for us. Our tour sent us up the western coast of the island, stopping in Bunratty to see the sister castle of Blarney. Bunratty Castle was built around the same time period, with almost an identical blueprint, but it was in much better shape than it’s more famous sibling. Bunratty was surrounded by a reconstructed village and the inside was filled with period furniture and costumed guides that made this trip seem like we’d gone back in time. Next we ventured through the Karst Landscape known as The Burren – a strange, rocky area that seemed like being on the moon. Finally a stop in Kilfenora, the City of Celtic Crosses, where we toured a graveyard filled with beautiful stone Celtic crosses – where Miss Filetti actually got to help dig a grave with a pick axe. 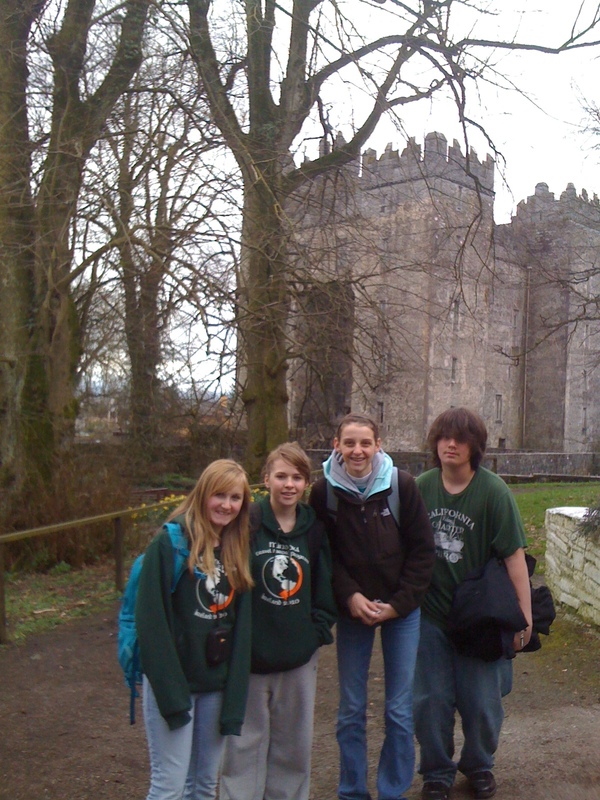 Minooka kids sporting are awesome TAP shirts in front of Bunratty Castle. The natural beauty of Ailwee Caves and The Cliffs of Moher, along with a stop in Galway moved our tour further north, taking us into Yeats Country – the area of the country made famous by Ireland’s most popular poet, William Butler Yeats. The caves were amazing, allowing us to go down beneath the limestone to see what the wet air and rainy days do to Ireland’s underbelly. The cliffs were just plain gorgeous and a completely different look at erosion, both were incredible ways to learn science. Yeats Country, which included stops in his hometown Sligo and the poet’s church and gravesite, as well as drive-byes of the sites of some of his most famous poems – The Lake Isle of Inishfree and the mountain, Ben Bulben – were probably the best places TAP has ever taken a moment to study poetry. Soon we crossed over into Northern Ireland were we had an Indiana Jones style adventure on the Carrick-a-rede Rope Bridge and debated science versus mythology at The Giant’s Causeway. Then we stopped in Derry, or London-Derry, depending on if your from the Ireland side or the Northern Ireland side of the border. We learned a lot in Derry about the Irish struggle for independence and saw the site of Bloody Sunday. On the bus ride out, Lorna played some U2 for us to cement the experience in our minds. Our big loop around Ireland was nearly complete, but before heading all the way back to Dubline, we stopped at Newgrange. Newgrange is an ancient burial temple built by the Celtic people nearly 5,000 years ago. According to our guides, that makes it the oldest man-made structure on Earth, even older than the Pyramids in Egypt. We learned all about megaliths, burial tombs, dolmens, standing stones, and ring forts on our travels, but nothing prepared us for riding out into the countryside and actually going inside a 5,000 year old building. Adding to the fun, the folks at Newgrange don’t allow groups to enter, so we had to park our bus a ways down the road and break into a bunch of little fake families to buy our tickets. It was a little strange to pretend to be some of the kids’ dad, but we’ll do what ever it takes to get a chance to see one of the most incredible sights on the planet. One last long bus ride with the world’s greatest driver, Kevin, brought us back to Dublin. We had one last day on the Emerald Isle, so we spent it leisurely strolling around Dublin, seeing some of the sites we missed on our first visit. I think everyone on the trip wished that our last day would last forever. Walking around the shopping district, up and down the river, and across the beautiful bridges, we soaked in every last bit of Irish charm, enjoyed street musicians playing their tunes, and made plans to return to Ireland again some day. We made some great friends, had some incredible experiences, and not only do we have memories that will last a lifetime, we all took a bit of Ireland home with us in our hearts.